RealTime Gaming is one of the oldest software provider companies in the world. RTG was first established in Atlanta, Georgia in the distant 1998 and, as of the time of this writing, has been operating for more than 20 years. Over time, RTG became one of the world’s finest primary developers of online casino games, creating numerous slots and table games. RealTime Gaming is one of the few companies that have a place in the US online gambling market, even after the Unlawful Internet Gambling Enforcement Act of 2006. There is a large number of online casinos that use RTG software and an even greater number of players who enjoy their games. 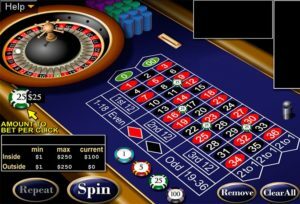 As part of their table games library, RealTime Gaming have developed several roulette titles, which have become quite popular with the general player base. While not so many in quantity, as is the case with other software providers such as Playtech or Microgaming, these titles are no less entertaining and any fan of the roulette genre should give them a try. Traditionally, RTG casinos have been known to offer their games via a downloadable casino client, but most of them also offer some form of instant play interface, which will allow you to play directly within the window of your browser. Each method has its own good and bad side; the instant play interface allows you to play immediately, but at the expense of the visual quality, whereas the opposite is true of the downloadable client. Ultimately, it does not make that much of a difference, but some players may have an issue with one aspect of the experience or another. Alternatively, most RTG online casinos will offer players the opportunity to play on the go using their mobile devices, e.g. a smartphone or a tablet. Below, we will go over some of the RTG Roulette games currently found in online casinos. European Roulette is an all-time classic that any gambler can appreciate. This is, arguably, one of the purest versions of the game that you can enjoy in your spare time. This style of roulette features 37-pocket wheel, that comes with 36 alternating red and black pockets, as well as, a green one for the zero. With a payout ratio of 35:1 for a Straight Up bet, we can calculate that the house edge is the traditional 2.7% across the board. European Roulette by RTG stands out from the rest with its excellent graphical fidelity and clean user interface. Placing bets and navigating the in-game menus is incredibly easy and anyone can quickly get an idea of how the game is supposed to work. Additionally, this game also includes a racetrack wheel, which represents the numbers in the exact order they appear on the roulette wheel, and within the racetrack, you will find the Voisins du Zero, Tiers du Cylindre, and Orphans bets. These are not of vital importance, but it is convenient to have them at our disposal. The graphics of this game are nothing to scoff at either, even if they are somewhat outdated. The table is presented beautifully and the game does an excellent job of immersing you in the casino atmosphere. Overall, there is very little not to like about this game and any roulette fan will be very satisfied with what RTG has to offer. French Roulette is yet another classic style of this timeless genre. The French version of roulette is arguably the closest game to the original and it represents the ultimate gambling experience for many players. It is no surprise that French Roulette has become such a hit with fans since it is one of the finest casino games ever created and now you can play it from the comfort of your home. RTG has taken great care to replicate the experience as much as humanly possible and the result is no less impressive. French Roulette by RTG is a game commonly found at many online casinos that work with this software provider. This version of roulette is played with a 37-pocket wheel, featuring 36 alternating red and black pockets and a single green one where the zero is located. This means that your odds of winning a Straight Up bet are 36:1 while the payout would be 35:1. With this information into account, we conclude that the house edge present in French Roulette stands at 2.7%, which is the standard for a 37-pocket game. Additionally, this game also features a rule exclusive to the French version – the ‘la partage’. Whenever you place an even money bet and the ball lands in the zero pocket, you will traditionally lose the bet. However, the ‘la partage’ dictates that whenever this occurs, you are entitled to take back half of your bet. With this rule in place, the house edge for even money bets comes down to 1.35%, making this version of the game the most favourable in terms of odds. As far as presentation is concerned, RTG does not disappoint. As soon as you open the game, you will notice that the game sports beautiful and detailed graphics, which will mesmerise you and truly engulf you in the casino setting. Immersion is a very important factor when talking about online games and in this sense, French Roulette does a brilliant job. American Roulette is considered by many to be one of the best versions of this game. It is primarily played in North America and its origins trace back to the 19th century in the United States. Many European gamblers might not be totally familiar with American Roulette or know what the differences between the different versions are. This is due to the fact that there are hardly any land-based establishments in Europe to offer this style of the game. American Roulette is played with a 38-pocket wheel; 36 alternating in black and red, as well as, two green ones for the zero and the double zero. This change has a significant effect on your chances of winning and since the game does not adjust the payout ratios, the house edge rises to 5.26%. Additionally, with the double zero comes a bet type exclusive to American Roulette. This is known as the Basket Bet, where you place a single unit on 0-00-1-2-3. This wager has a 6:1 payout ratio, which means that the house edge for the Basket Bet goes even higher at 7.89%. This changes things for most gamblers and many are known to avoid this version of the game because of the increased house advantage. On the gameplay side of things, you will find that American Roulette performs just as well as any other of RTG’s games. The user interface is clean and perfectly usable, making menu navigation as easy as possible. Bets can be placed simply by selecting your chip denomination and clicking on the numbers grid. There is nothing in here that should cause you any trouble. Graphically, American Roulette is on par with the other RTG games that we have listed so far. New American Roulette is one of the available RTG roulette games hosted on online casinos. Practically, there is no difference in how this game plays as opposed to the original American Roulette. The only changes are visual and New American Roulette does look slightly better. The rules, odds, and payouts remain unchanged. Choosing between the two is a matter of aesthetic, which is a subjective issue. While the software that comes from RTG is nothing short of excellent, some online casinos that feature it can be less than exemplary. RTG does not discriminate in licensing its games and as a result, many shady companies have got hold of RTG games on their platform. That is not to diminish the quality of the product, rather to warn you about some of the undesirable situations that you may find yourself in. Unfortunately, this is a fact of life and there is nothing that we, as consumers, can do about it. What you should always look for first in an online casino is some form of licensing from a governmental regulatory institution. Online gambling is a heavily regulated industry and there are many rules in place that are meant to protect consumers from fraud. Ideally, you are looking for an online casino licensed by the United Kingdom Gambling Commission or the Malta Gaming Authority. These are the two most respected government bodies that oversee all gambling operations based within their respective jurisdictions. In order to acquire a license from either of these institutions, an online casino has to pass some very strict tests and prove itself to be legitimate and trustworthy. Overall, RTG is a perfectly fine software provider and you will find many excellent games within their library. That being said, we would remiss not to mention that some of these titles came out years ago and while they are still perfectly playable, most have begun to show their age. Unfortunately, RealTime Gaming has not done a good job of keeping up with the times and updating their games to meet modern standards. The number of titles is also dreadfully low, at least, where roulette is concerned. With so many other software providers, such as NetEnt, Play’n GO, Microgaming, Playtech, etc., all fighting to be in the spotlight, we can find no valid reason for RTG to keep going like it currently is. When it comes down to it, RTG does offer users good games, but it is highly likely that the company will not be able to maintain its place with so much competition around.